As a surgeon probes deeply into the human body to promote the healing of the physical body, we must come to understand the inner workings of our personal narrative and identity to heal the human psyche. Eckhart Tolle essentially defines unconsciousness as a reaction of the false self. “Unconscious means to be identified with some mental or emotional pattern. It implies a complete absence of the watcher.” Without the objectivity of the observer we are unable to respond to our life’s experience, to choose P-A as our narrative and our True self as our identity. This article will add to our awareness of what is involved in the process of awakening. William Irwin Thompson makes the critical distinction between the unconscious and “being unconscious” which is the state of most of humankind. “The unconscious character experiences his or her fate as external to its consciousness and laments the seemingly external infliction of the events of its life.” By learning to respond to life as it is, the truly conscious person is able to transcend both the influence of his unconscious and the illusions of world of form in which he is immersed. The false self is an insidious and for most of us an irresistible influence in choosing self-destructive behavior. All religions have long recognized the unconscious and conscious negative sources of “sinful” human behavior. Gerald Heard describes the classic addictive drives of what he calls the ego and the ineffective remedy advocated by Christianity and in one form or another by all the world’s major religions. “They would loose themselves from the three ties which the ego weaves round the growing soul. Those three ties are: the addictions of appetite [sensation]; the possessiveness of ‘means,’ of money, of ‘goods’ [security]; and the pretentiousness of fame and reputation [power]. So they aimed at renouncing the ego by the triple vow of Chastity, Poverty and Obedience.” We cannot over-learn about the three energy centers of the false-self survival strategy since they are the source of so much of our suffering, confusion and dissatisfaction with life. The Sensation Center involves the mostly unconscious seeking of affection, esteem and sensations which can often lead to substance and process addictions. The sensation center is revealed at both the conscious levels and the unconscious levels by what Americans purchase. Some of the desires of Americans are also “secret” in that they take place in the hidden shadows of society. Eric Schlosser in his book Reefer Madness, followed the money to reveal that the domestic harvest of marijuana made it America’s largest cash crop at close to $20 billion a year. What this reveals about our American culture is a hypocritical majority and a deeply repressed subconscious shadow. The illusion of power is sought by attempting to control people or situations promoting status, self-image, influence, accomplishment and approval seeking: it is promoting others’ dependence on us. The unconscious as we have described it may initially appear a hostile threat but that is not the case as Seth assures us. “You are not at the mercy of unconscious drives unless you consciously acquiesce to them.” And, of course, that acquiescence occurs when we react to what is happening rather than respond. We return as always to the simple teachings of the mystics who lived in the present moment: Love thyself, love thy neighbor and love Creation. When we practice responding which is love thyself in action, we are no longer at the mercy of our complexes and we have discovered authentic power over the unconscious. Nor do we need to surrender to our neuroses which are defined as any functional disorder of the mind or emotions involving anxiety, phobias, or other abnormal behavior symptoms. The false self (ego) is the human personality or identity acting unconsciously. “So if evolution is to go further, it has to transcend the ego—the personality when it learned all it needed [was] a selfless dedication to great tasks without the inducement of personal aggrandizement.” All satisfying “great tasks” as Arthur Young calls them are conscious responses to life’s opportunities. Becoming conscious can involve “objectifying” the above elements of unconsciousness, that is, becoming aware that they are illusions. This is usually done through the process of meditation. Attaining an awareness of these elements, that is, shining the light of consciousness upon them will dissolve them as the sun dissolves the morning mist. What occurs either gradually or as a breakthrough will be an “insight” into the nature of reality and liberation or present moment awareness. The fruit of awareness is equanimity where one is able to respond to life rather than react. Reacting to life means remaining unconscious and in the grip of craving and aversion. Responding to life “as it is” means not resisting anything but choosing to see one’s life experience as perfect—not needing to be changed in any way. The Universe is then seen as friendly—and one has entered the Absolute. Although such a state is wordless, words such as serenity, peace, freedom, joy, happiness, liberation, tranquility and compassion all point to this state of being. Changing our beliefs about the nature of reality, our identity and what healthy human behavior would be is essential to integrating our collective and individual unconsciousness aspects into our present-moment awareness. Laurens Van der Post, a Jungian analyst, describes Jung’s own struggles with his unconscious. “Its negative aspect dwindled into insignificance beside his revelation of its positive objective nature and its own vital involvement in the enlargement of consciousness in man. The trouble started only when the part of the human personality which was conscious behaved as if it were the whole of the man.” We are healthier and more powerful than we can imagine if we can only embrace the life we have been given as it is without fear. 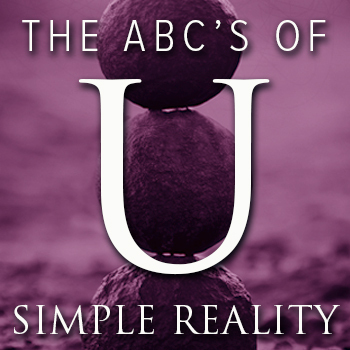 Simple Reality provides the context and practice for doing that.